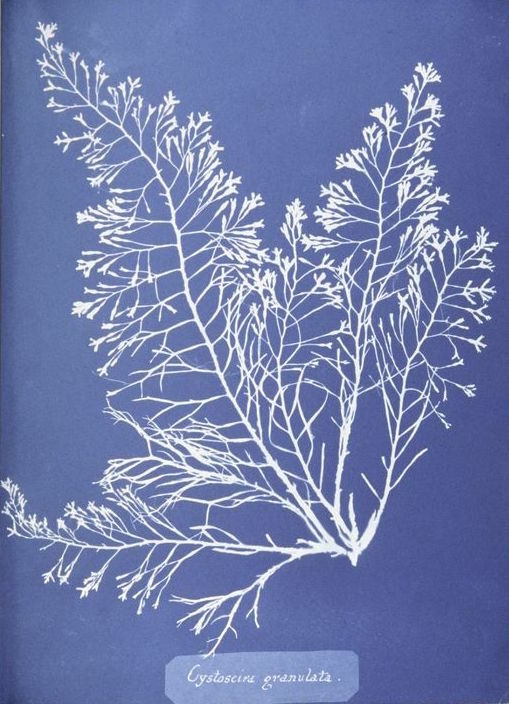 Returning this week to photography, the Star brings you a long promised version of Anna Atkins’ Photographs of British Algae. Atkins was most likely the first woman in the world to make an image by any photographic means. She was definitely the first woman to make a photographic book and in fact the first person to do so, period, antedating William Henry Fox Talbot’s Pencil of Nature by about two years. Of the seventeen copies of the book in existence none of them match, and none are particularly defintive. All that anyone knows for sure is that is that the Royal Society in London claims to have the version that Atkins herself approved. It has fewer plates than the copy in the British Library, yet they remained convinced of its perfection–after all, they are the Royal Society. This version is compiled and moderately color corrected from original scans by our publisher, Omar Willey, whose interest and enthusiasm for Atkins’ work knows no limits. It is based on the copy in the New York Public Library which used to belong to Sir John Herschel–the man who invented the cyanotype process which Ms. Atkins uses for her photographic plates. It presents only the original edition’s parts 1-12 and makes no claims to be definitive or complete or anything else. But enough about technical matters. This book rocks, and we wanted you to have it not just for its historical value but because the images are quite beautiful and, who knows, may encourage you to think about science and stuff, too.